There are two things I take very seriously when I'm making soup. First, the liquid has to be very flavorful. It should be delicious all on its own - it shouldn't be mildly salted vaguely vegetable-scented water. Second, the soup has to be substantial. Around here, soup is very seldom an appetizer - usually it's a meal. Maybe some bread on the side. Or a small sandwich. Or a salad. But if there's soup, chances are it won't be followed by a roast with all the trimmings. In this case, the turkey stock started with wings that I got from KOL Foods. Wings have a lot of flavor, but not a lot of meat compared to breast or thigh. You can strip the meat off, if you like, either after roasting or partway through the cooking, if you want to toss the meat back into the soup. Or, just let the wings cook and cook and cook and cook until you've got a liquid that's so concentrated it jellifies and jiggles when it's cold. Roast the turkey wings until they're a lovely mahogany brown. It doesn't matter if they're cooked all the way through - these are going into the soup. When they're roasted, put them into a slow cooker. Add all the drippings. Add water to the pan you cooked the wings in and scrape up every last bit of browned goodness that you can. Every bit. Add that water to the slow cooker. Add the onion and celery. Add enough water to just barely cover the wings. Cover and cook on low for as long as you can. I let mine cook for 14 hours in the slow cooker. If you want to salvage the meat* from the wings, check them after about 2 hours. Remove the wings, salvage as much meat as you like, and return everything else to the pot and continue cooking. You might have noticed that I didn't add any salt yet. There's a reason. It's hard to tell how much you'll need, since your wings could have been brined before roasting, which means you might not need any additional salt. There's plenty of time to season that stock before we're done. When the stock is done, remove the wings and strain the stock through a fine-mesh strainer to remove any odd bits. Skim the fat off the top. If you aren't continuing the soup-making right away, you can refrigerate the stock and the fat will rise to the top and solidify so it's easy to remove. 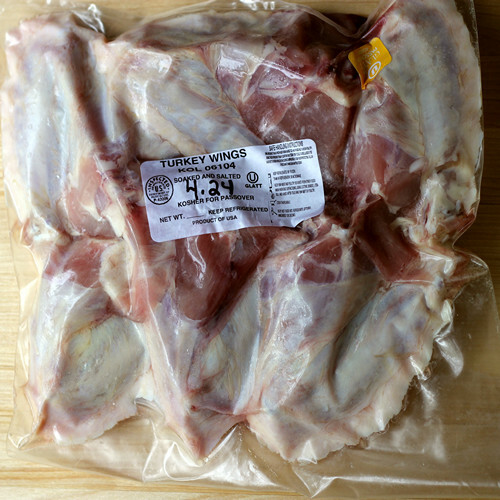 *Normally when I make turkey soup, I use the carcass of a turkey, so it has already been roasted and the usable meat has been stripped off. If I want meat in the soup (and usually I'd rather have it in a sandwich) I cut up chunks of breast meat or whatever else is left from the meal and add that at the end of cooking. Put the stock in a large saucepan, Dutch oven, or similar vessel. Add the celery and carrots. Cook on medium heat - a happy simmer is what you're looking for - until the vegetables are cooked almost all the way through. Watch the level of the liquid, and add water as needed. You should have a very flavorful stock that doesn't need additional reduction. If your liquid-to-solid ratio is making this seem too much like a stew and not enough like a soup, add water, as desired - but this should be a hearty, flavorful soup and not a vat of liquid with a few bits of lonely vegetables floating through it. Taste for seasoning again and add more salt, poultry seasoning, or lemon juice, as desired. Disclaimer: I received a package of turkey wings from KOL foods for this post. KOL Foods is the only source for domestic, 100 percent grass-fed, kosher beef and organic, pastured, kosher chicken, turkey and duck. We also provide, grass-fed no-nitrate deli and sausage as well as grass-fed lamb and wild Alaskan salmon. KOL Foods’ products connect to tradition, the land, a sustainable future, and good health for friends and family. We know our farmers and tell the story of their animals. KOL Foods is committed to kashrut, transparency, the environment, animal welfare, health and offering the most delicious meat on the market.